Avariety of suction-irrigation systems is currently available (Fig. 10). The aspirator, which is connected to a suction system, consists of a 5 or 10 mm metal or plastic tube, with suction controlled by either a one-way stopcock or a spring-controlled trumpet valve. The irrigation channel is also operated by the same mechanism. 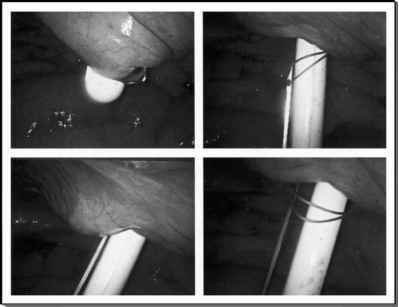 The irrigation may be pressurized to adequately clear blood clots for optimal visualization. Usually normal saline or lactated Ringer solution is used as irrigation fluid. Heparin (5000 U/L) may be added to prevent clots from forming in the surgical field. Furthermore, a broad-spectrum antibiotic may be added to the irrigant fluid in situations where infection may be a concern. eEthicon, Inc., Somerville, NJ. fU.S. Surgical Corp., Norwalk, CT. gLSI Solutions, Victor, NY.